The movement made up largely of working and lower middle-class citizens has won widespread public approval as it is seen by many as a means of making the voices of ordinary men and women heard. But after months of unrest in Paris and other French cities, Benjamin Griveaux said the gilets jaunes are not interested in the three-month debate on the reforms promised by Mr Macron, but instead want to overthrow the young president. Speaking at a press conference on Friday after the weekly cabinet meeting, Mr Griveaux said members of the movement “seek insurrection and basically want to overthrow the government”. He added: “They are henceforth involved in a political struggle to contest the legitimacy of the government and of the president of the republic. Mr Macron said he intends to write a letter to the French people this month outlining how he will deliver his ambitious plans. After first dismissing the protesters as “thugs” and vowing to not bow to pressure, Mr Macron backtracked when he announced a generous £10billion package of concessions, including raising the minimum wage, taxcuts for pensioners and the abolishment of taxes on overtime pay. But a month after the announcement which he had hoped would defuse public anger, the yellow vests continue to pour into the capital’s street and are showing no signs of letting-up. ‘Angry France’, one of the group which makes up the yellow vests, rejected the president’s offer of a national debate. The movement, which does not have a leader, sees the 41-year-old as a ‘president of the rich’ and has accused him of being out-of-touch with the reality of many working class people who are struggling to make ends meet. 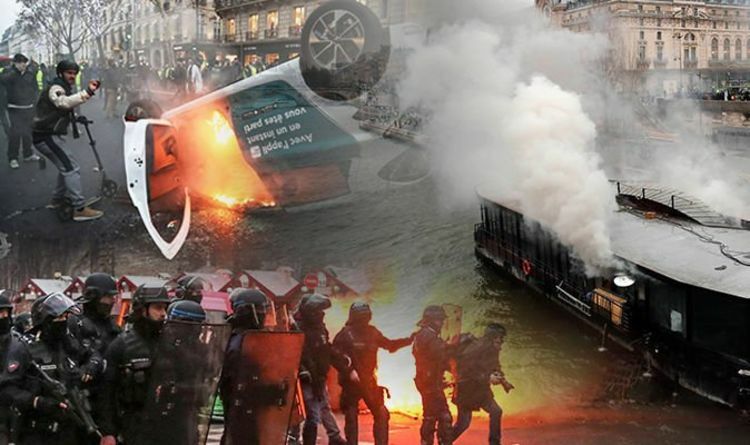 It comes as people began to gather in the streets of central Paris for the eight weekend of rallies which have at times turned violent when riot police clashed with demonstrators. Some chanted "La Marseillaise" national anthem while others waved banners reading "Macron, resign!" and "Abolish the privileges of the elite". Protester Francois Cordier said: "They have no right to leave us in the sh** like this. We're fed up with having to pay out the whole time, we've had enough of this slavery, we should be able to live on our salaries." Rallies were also held in Bordeaux, Rouen and Marseille, though the turnout appeared to be lower than that in the early weeks of the protests. Mr Macron began the new year by hardening his stance against the movement and on Wednesday police arrested one of the most prominent figures of the yellow vests. "We can't work less, earn more, cut taxes and increase spending,” said the president in a New Year’s Eve address.